Portland Design Works is located in the heart of the rain-soaked Pacific Northwest, so when they made their Poncho Fenders, they used the finest-quality materials to keep their unrelenting weather at bay. Durable polycarbonate bodies are held rigidly in place by thick 6 mm stays to keep the clacking down over bumpy roads, but break-away front stays still release in case of an obstruction so you don't lock up your front tire. Available in two models, the Road version is designed for 700c x 23 mm tires and include additional hardware for frames without fender eyelets. The City version is designed for 700c x 35 mm tires. Claimed weights are 454 g / Road, 567 g / City. Sturdy and no rattle fenders. These fenders are sturdy and don't have any annoying rattles like others I have used. Very adjustable and simple to install although I did have to cut the stays to accommodate my bike. Not a big deal. Some of the best and easiest to install fenders! I bought a pair of the Portland Design Works Poncho Road Fenders about a year ago for road-turned-rando bike and overall have been happy with them. They do a really great job of keeping spray off my back and minimal exposure to feet and drivetrain. 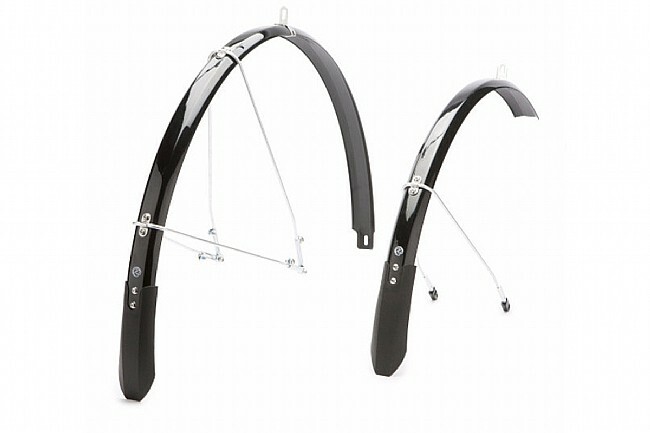 There are a couple quirks about them that kept me from giving them 5 stars, but overall I like them and feel like they are the best option for a lightweight low profile fender that doesn't look too bad on a road bike. -Front fender stay has quick releases that disengage the stay from the fork if the fender is bumped (I'm actually not sure this is a pro, since I have several times tripped the release when my foot hit the fender while starting pedaling from a stop, but I guess there is a safety aspect here that might be beneficial). - On the lighter end of the weight range for fenders. Fender stays are pretty robust but extremely light. - For those that like it there is an accessory tail light that can be integrated into the fender. - The road version is the smallest width fender I could find and has a nice clean, aerodynamic look for 23mm tires. -Full-length front fender reduces road spray onto the drive train and your feet and legs. - Both fenders require removing the brake calipers for installation. I found that adding the fender hanger bracket resulted in the caliper fastening bolt to come loose unless a locking washer was added between the fender hanger and the bike frame. This installation prevents easy removal of the fender, but I knew this would be the case so it isn't a big deal to me. - The rear fender hanger requires you to bend metal tabs around the fender. The metal is quite stiff and the bent portions ended up at different lengths, which made the whole bracket sit off center slightly. This didn't affect functionality but seemed like a hokey solution. Also, if you don't bend the hanger to really 'grab' the fender it will will slip and mess up the fender spacing with the tire. - BEWARE of placing the fenders too close to the tire. I intentionally did this to have a clean, 'tucked' look, which was great until I flatted the first time and the deflated tire caught the mounting nut plate for one of the rear stays, rolled the fender up into itself, and caused the rear wheel to lock up and grind a 2 inch hole in my tire. Also, having the fender this close prevents rocks picked up by the tire from having an escape route other than to grind their way along inside the fender until they are ejected out the front. This sound is unnerving and would probably result in a flat for thin or worn tires. I now have them about 38 off the tire and I think this has helped. Very satisfied. This is a good quality product. Portland Design Works appears to be a great company. This is my first time buying one of their products, and I am happy with the purchase. I don't have experience with Portland Design Works' metal fenders. I was turned off from those because of the price. Along came these plastic fenders which appear to be identical except for the material, and they are a more reasonable price. I couldn't resist, and I needed some fenders to extend the season. Construction of the fenders is very minimal, and I really like that. There aren't any weird or nonfunctional additions to the design. They are also very solid, and once you finish any necessary tweaking, they are free from further maintenance. 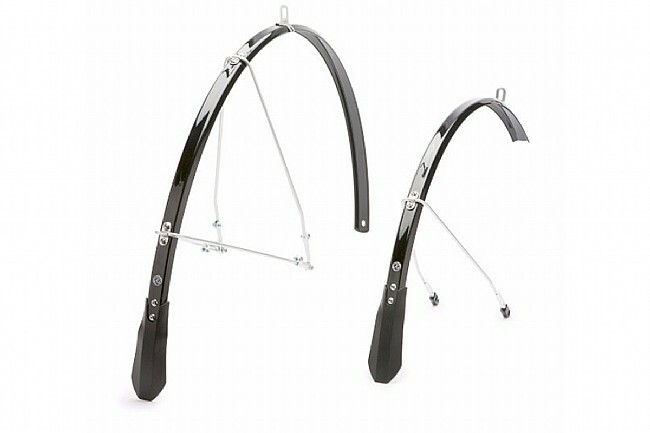 I bought the 30mm road fenders for my steel Pinarello. The clearance in the bike is fine, but clearing my 6800 Ultegra brake calipers is very, very tight. There just isn't a way around the tight clearance, and I am using 23mm tires. If I had to estimate, I would say there is little more than 1mm of space between the tires and the fenders at the brake calipers. But they work! They don't make noise except for the occasional pine needle getting sucked through a tight spot. If I was worried, I could trim some material from the corners right where the fender contacts the caliper, but I haven't had any trouble yet. My bike doesn't have eyelets. I attached the fenders to my bike via P clamps wrapped around the framefork tubes. 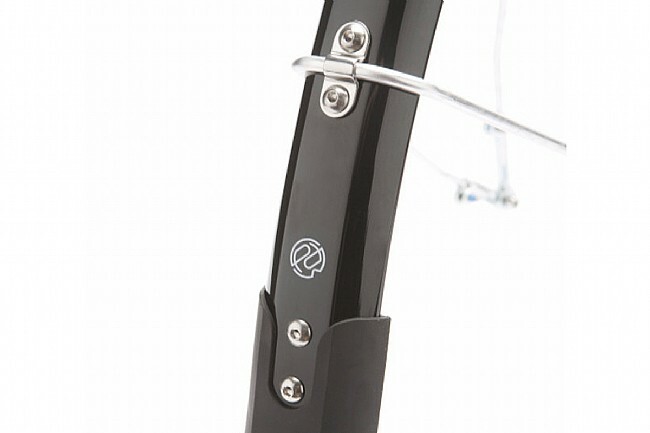 The fenders come with adapters for bikes without eyelets, but these adaptors attach via quick-release skewers. I didn't want to monkey around with aligning things on the road if I had to change a flat, so I opted not to use the provided adaptors. P clamps are the way to go for me. Coverage is great! My shoes do not get sprayed by the front wheel. I have been on a few wet group rides, and guys behind me report that they can draft closely without being sprayed by my back tire. Portland Design Works got this very right by designing these fenders with full enough coverage over the back wheel for group rides. The fenders are adequate enough, I'm not sure I will like the polycarbonate better than metal. The mudflaps work fine. Not all the hardware was in the package, it was missing 4 washers. Otherwise the fenders seem stable and capable for around town riding.